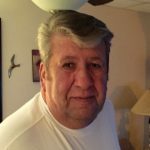 Obituaries » Thomas J. Tarnalicki, Sr. Subscribe to updates for Thomas Tarnalicki, Sr.
Thomas J. Tarnalicki, Sr., 68 of the Port Griffith section of Jenkins Township, passed away suddenly Wednesday morning, February 6, 2019 at his home. Born in Plains Township, he was the son of the late Anthony and Johanna (Suhena) Tarnalicki. Tom attended Plains Memorial High School, and was a Marine Corps Veteran of the Vietnam War. He was employed as a boilermaker for Boilermakers Local 13 until his retirement and last as a shuttle driver for Geisinger in Scranton and Wilkes-Barre. He was a member of New Life Apostolic Church, West Pittston, and the Boilermakers Union Local 13. Tom had a Larger than Life personality that would fill a room. He loved to go to his cabin on Lake Ontario and spend time with best friend and love of his life, his wife Ruth. Tom also loved and enjoyed spending time with his grandchildren Shane, Peter, Makenzie, Madison, and Chase Borum. He was loved by many and will be truly missed. Surviving are his wife of 48 years the former Ruth Yale, son Thomas Tarnalicki, Jr. and his companion Deana Kasteleba, Pittston, daughter Ruthann Borum and her husband Peter, Shavertown, 5 grandchildren, brother Tony Tarnalicki and his wife Doreen, Plains, sister Kathy Brezney and her husband Gene, Swoyersville, and Barbara Marsh, and her husband Carl, Exeter, nieces and nephews, and his four legged best buddy, Oliver. Funeral services with Military Honors accorded by the United States Marine Corps, will be held Saturday, February 9, 2019 at 4:00 pm at the Corcoran Funeral Home, Inc., 20 South Main Street, Plains, PA 18705, with Pastor Philip Webb, Pastor of New Life Apostolic Church, officiating. Family and friends may call Saturday afternoon from 2:00 to 4:00 pm at the funeral home. In Lieu of flowers, memorial donations may be made to New Life Apostolic Church, 207 Boston Avenue, West Pittston, PA 18643 in Tom’s memory.